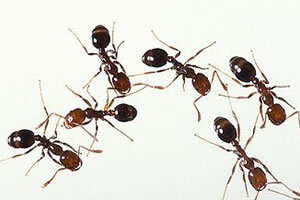 Do you have a problem with ants, give Sandy Straits Pest Control a call, and our friendly office staff will discuss any problems or concerns you have about ants and arrange for your ant treatment today. In most cases you, and your children don’t need to leave your home unless you are sensitive to chemicals. We just ask that you leave the areas we are treating while we complete our treatment. Your pets will need to be inside while we complete our outside treatment. Once the chemical is dry, usually about half an hour, it is safe for them to return. Our technicians will treat the external wall voids with a low toxic insecticidal dust using a cordless dusting machine. The external perimeter around the base of your home will be sprayed with a low toxic insecticide to create a treated area of protection to control the ants. Our 6 month ant treatment warranty covers the internal of your home (excludes outside). Call us today about our discount ant treatments. Click here to download the Termidor Ant Brochure. Call us today about our discount combined general pest treatment for cockroaches, silverfish, ants and spiders.